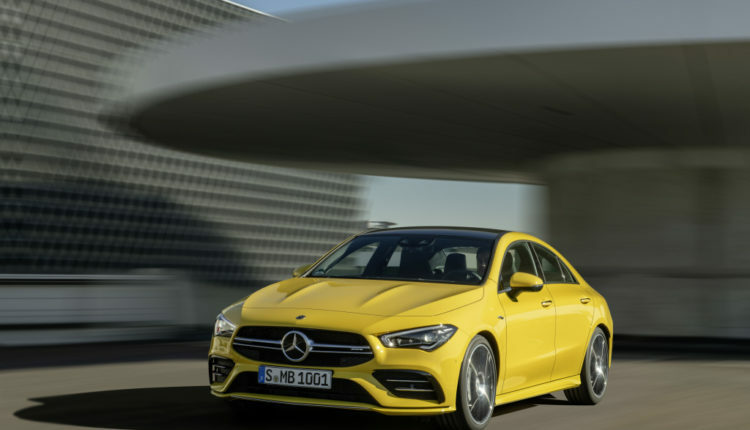 With its iconic design and agile driving dynamics, the new CLA 35 4MATIC is an attractive offer for a young, active and lifestyle-conscious target group. 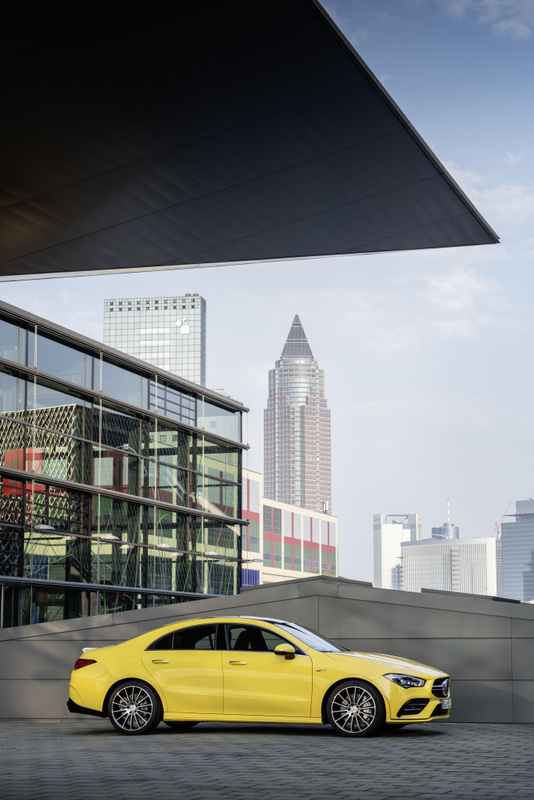 “The new CLA 35 embodies just this attitude to life – and enables stepping into the fascinating world of AMG Driving Performance in a particularly emotional way”, says Tobias Moers, CEO of Mercedes-AMG GmbH. Other distinctive features include trim elements in silver chrome on the louvres in the outer air inlets. From a side view, the aerodynamically optimised 18-inch light-alloy wheels in twin-spoke design (19-inch optionally available) and the accentuated side sill panels catch the eye. 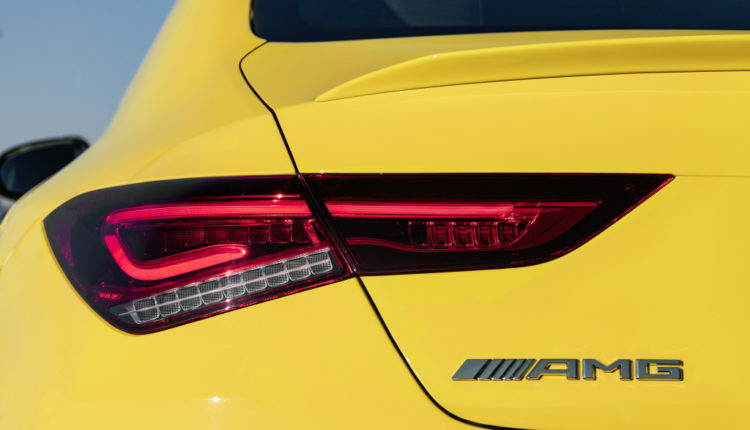 The rear view is dominated by the rear apron with a new diffuser insert, the small spoiler lip on the boot and the two round tailpipe trims on the left and right. 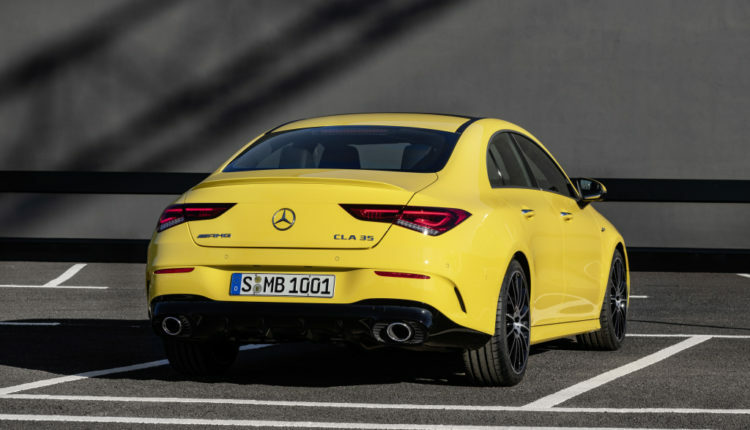 The two-piece, narrow tail lamps and the number plate housed in the bumper make the rear of the CLA look extraordinarily wide. Frameless doors open to an interior with a high-tech ambience where quality and elegance meet fully digital displays. This interior optionally stages the ambient lighting in 64 colours. Another characteristic feature is the seat covers which are available in ARTICO human-made leather with DINAMICA microfibre in black with contrasting red stitching and red seat belts or in ARTICO human-made leather in black/digital grey. Red piping on the microfibre DINAMICA trims element and ventilation nozzles with a red ring add further accents. The combination of sporty design and sophisticated details is also featured in the MBUX infotainment system with its innovative operating and display concept. 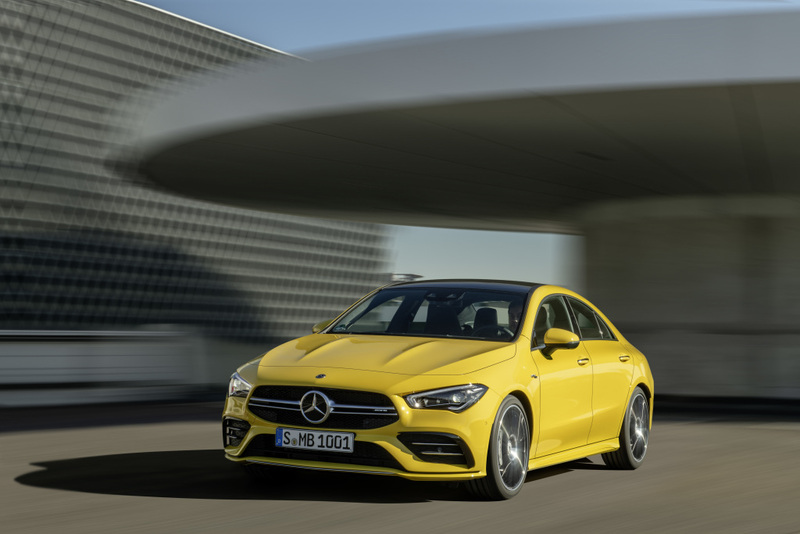 In the new CLA 35 4MATIC too MBUX replaces the previous COMAND systems and creates an even closer connection between the vehicle, driver and passengers. Emotionally appealing presentations underline the clear control structure and feature brilliant maximum-resolution 3D graphics. Visually, the two displays under one shared glass cover blend into a Widescreen Cockpit and as a central element consequently emphasise the horizontal orientation of the interior design. With the new optional MBUX interior assistant, select infotainment functions can be operated touchless and the reading light can be switched on and off. The assistant differentiates between driver and passenger interaction and recognises certain hand positions and movements. 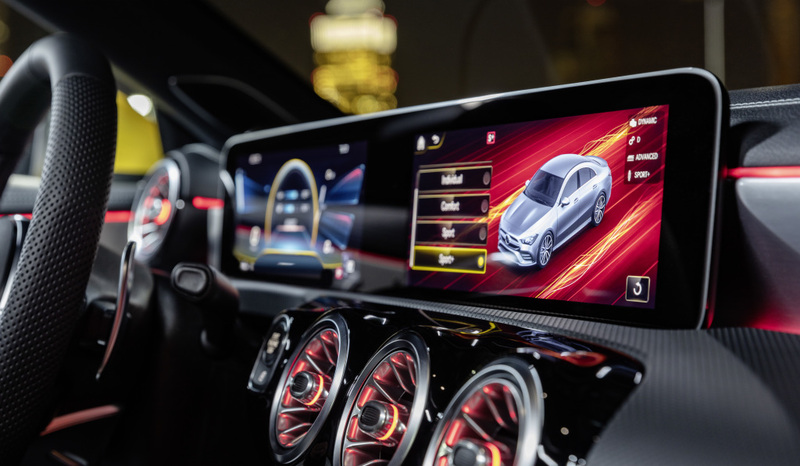 The interaction area for the MBUX interior assistant is in front of the media display up to the centre console, including the touchpad between the driver and the front-seat passenger. The MBUX interior assistant recognises movement toward the various operating elements of the infotainment system. The operator’s seat is enlarged on the media display if one’s hand is moved toward the touchscreen. The most suitable operating elements are automatically pre-selected. In the Radio and Media menu, the MBUX interior assistant reduces the number of operating steps. In the Navigation menu, the system fades in the navigation as soon as the hand moves to operate the touchscreen or touchpad, so that a symbol is selected directly. When displaying the camera image, as soon as the hand moves toward the touchscreen the MBUX interior assistant enables the four camera operating symbols from the 360-degree camera to be directly faded in. This means that the front, rear, right or left camera view can be directly selected. And needless to say, the CLA 35 4MATIC also comes with trailblazing voice control, activated with the words “Hey Mercedes“. Thanks to artificial intelligence, MBUX recognises and understands nearly all sentences from the fields of infotainment and vehicle operation, even if they are expressed indirectly. The steering wheel with the innovative AMG steering wheel buttons is available as an option. These consist of around controller with an integrated display beneath the right-hand steering-wheel spoke, plus two vertically positioned colour display buttons with switches beneath the left-hand steering-wheel spoke. The AMG drive programs are actuated directly via the controller. With the two freely configurable display buttons and the additional switches, further AMG functions can be controlled within easy reach, straight on the steering wheel. 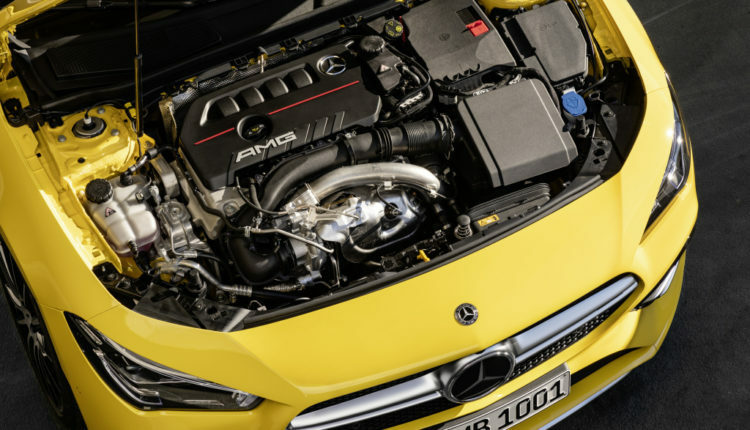 The 2.0-litre turbo engine is a new development and is based on the M 260 four-cylinder engine in the new A-Class. The new drive boasts a spontaneous response to accelerator pedal commands, high tractive power (400 Nm max. torque from 3,000 rpm), supremely active response and an emotional engine sound. The crankcase made of high-strength, lightweight die-cast aluminium reduces the vehicle weight where it matters most for driving dynamics. A twin-scroll turbocharger is used for turbocharging. It combines optimum responsiveness at low engine speeds with a substantial power increase at higher rates. The housing of the twin-scroll turbocharger is divided into two parallel ducts. Together with two separate exhaust ducts in the exhaust manifold, this makes it possible to channel the exhaust gases separately on the turbine wheel. The high technological standards of the new four-cylinder engine are also underscored by multiple efficiency-enhancing measures. These include CAMTRONIC variable valve control, intelligent thermal management for engine and oil, high-precision piezo injectors and multi-spark ignition. In production, the patented CONICSHAPE® cylinder honing reduces internal engine friction and also increases efficiency. 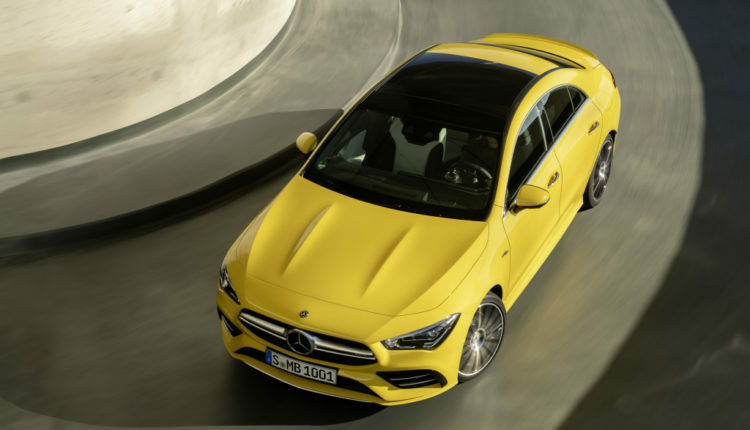 The AMG SPEEDSHIFT DCT 7G dual-clutch transmission also contributes to the agile and dynamic character of the new CLA 35 4MATIC. The gear ratios have been configured so that the driver experiences very spontaneous acceleration in all speed ranges, combined with fast shifting and optimum connections when shifting up. 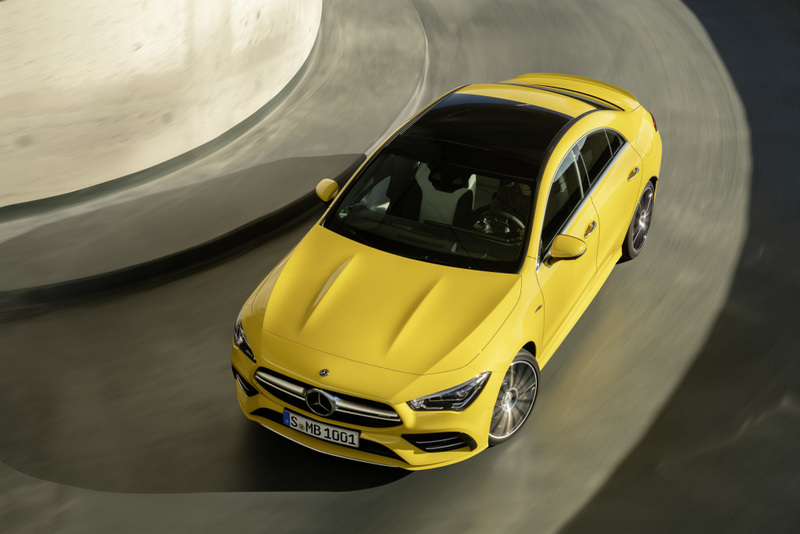 Dynamism, agility and performance – these three attributes characterise the standard all-wheel drive of the new AMG CLA 35 4MATIC. The variable AMG Performance 4MATIC combines the best possible traction with lots of driving fun. The torque distribution is infinitely variable to suit the dynamic handling requirements. The spectrum ranges from front-wheel drive only to a 50:50 per cent distribution to the front and rear axles. A multi-disc clutch that is integrated into the rear axle transmission is responsible for the variable torque distribution between the front and rear axles. It is controlled electro-mechanically. The influencing factors for torque distribution are not only the driving speed, the lateral and longitudinal acceleration and the steering angle but also the difference in rotational speed between the individual wheels, the gear selected and the accelerator position. The five AMG DYNAMIC SELECT drive programs “Slippery”, “Comfort”, “Sport”, “Sport +” and “Individual” enable a wide range of vehicle characteristics from comfortable to dynamic. They change relevant parameters, such as the response of the engine and transmission. The new “Slippery” drive program is optimised for low-grip, icy road conditions, with reduced power and a flat torque curve. Smooth gear changes and earlier upshifting support the driving impression characterised by stability. The “Comfort” program stands for comfortable and fuel-efficient driving, for example, thanks to very early upshifts. Suspension and steering are set up for an emphasis on comfort. “Sport” and “Sport+” place the focus on agility and driving pleasure with a sporty engine and transmission tuning. The sound of the turbo engine is more striking. “Sport+” is particularly emotional with double-declutching during downshifts and partial cylinder cut-off via a brief and precisely defined retardation of ignition and injection at full load. The “Individual” drive program enables the individual parameters to be selected and saved according to personal preferences. Also, the gliding function is available in the “Reduced” and “Moderate” drive settings. As a new feature in the AMG DYNAMIC SELECT drive programs, the new CLA 35 4MATIC comes with AMG DYNAMICS. 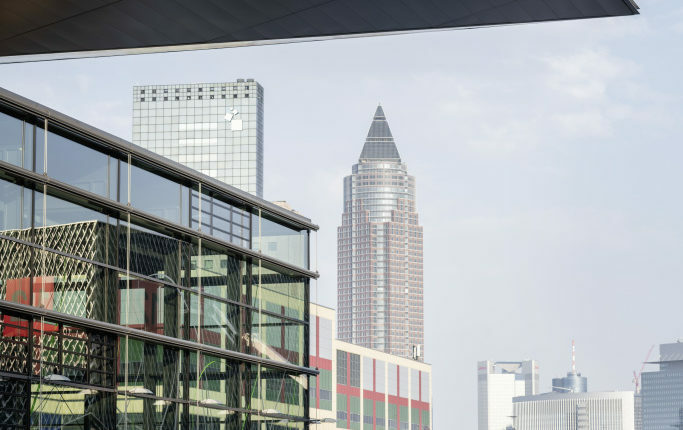 This integrated dynamic handling control system extends the stabilising functions of ESP® with agilising interventions according to the driver’s wishes. During dynamic cornering, imperceptible braking intervention on the rear inside wheel creates a defined yawing moment about the vertical axis. 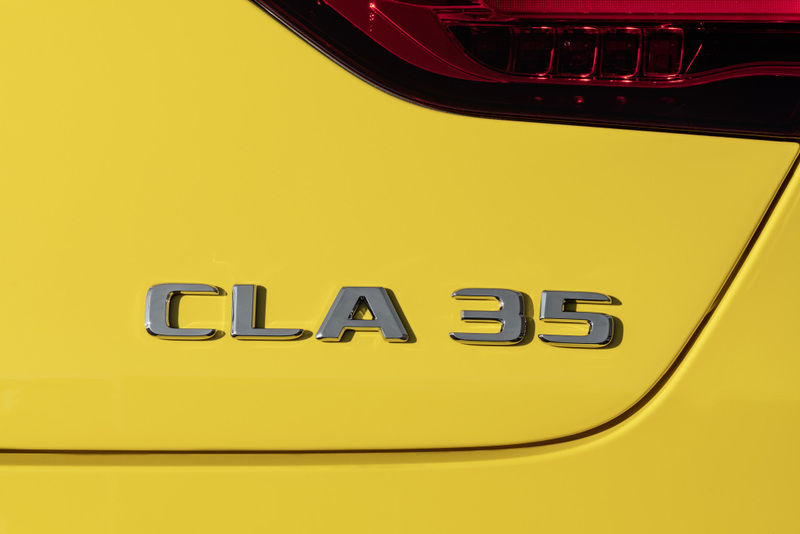 The effect: the CLA 35 4MATIC steers spontaneously and very precisely. 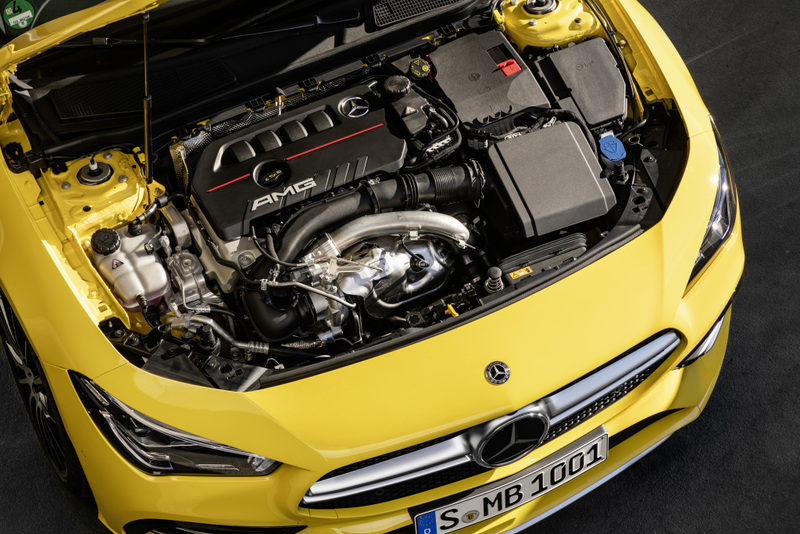 The different manifestations of AMG DYNAMICS are called “Basic” and “Advanced”. 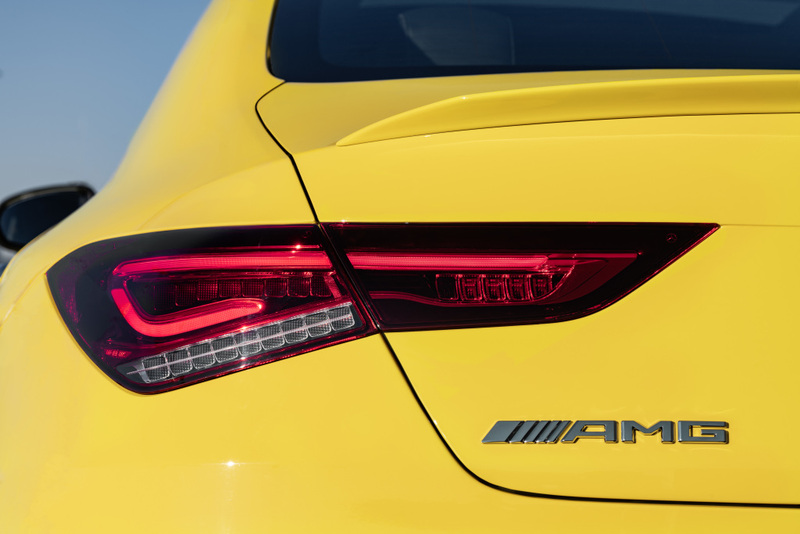 On the multimedia display, when a drive program is selected, the new AMG DYNAMICS symbol is displayed together with the corresponding additional information. “Basic” is assigned to the “Slippery” and “Comfort” drive programs. 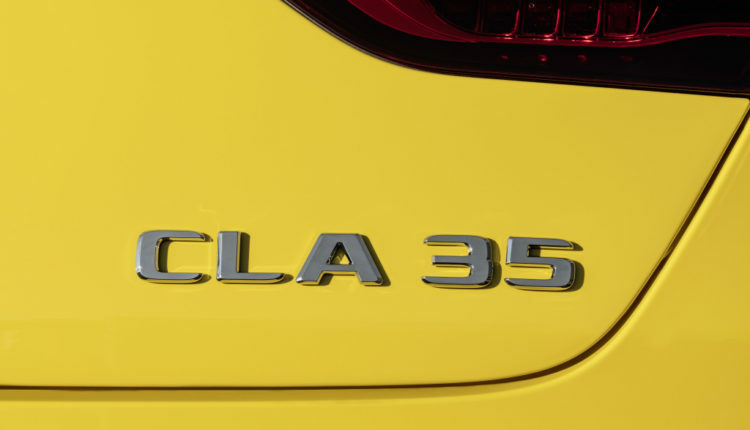 In this case, the CLA 35 4MATIC shows very stable handling with high damping of the yaw rate. A McPherson suspension strut construction is fitted on the front axle. The suspension is taken care of by one wishbone below the wheel centre, one spring strut and one tie rod respectively. 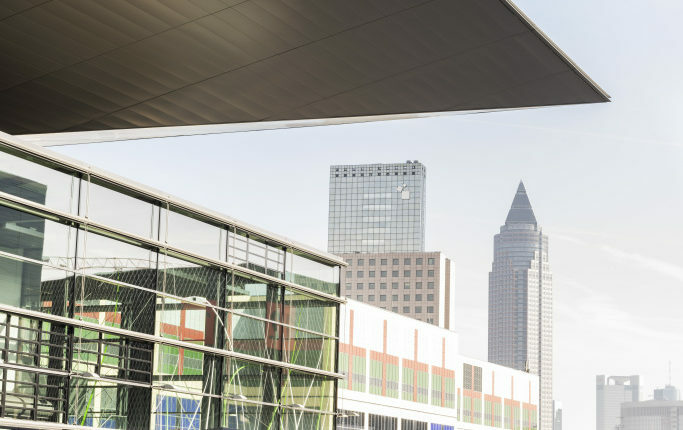 The unique axle geometry reduces the influence of the drive on the steering – for high comfort and agile handling. The new wishbone in aluminium reduces the unsprung masses enabling a more sensitive response from the springs. The AMG-specific front steering knuckle has a radially bolted brake calliper – a technology originating from motorsport. The high-performance braking system ensures fade-resistant deceleration and short braking distances. Its dimensions correspond to the well-proven A 45 4MATIC model. The front axle is fitted with new 4-piston monoblock fixed callipers and 350-millimetre brake discs, the rear axle with 1-piston sliding callipers and 330-millimetre brake discs. The discs are internally ventilated and perforated to dissipate heat better and prevent brake fading, even with extreme use. The silver-painted brake callipers have black AMG lettering. The speed-sensitive, electro-mechanical sports power steering supports a sporty driving style with its direct turn-in ability. It has a special rack with a variable transmission ratio and two characteristic curves: depending on which drive program the driver has selected, it provides taut and sporty or more comfortable steering feedback. The rigid mounting in the integral carrier connects the steering even better with the body and thus increases steering precision. 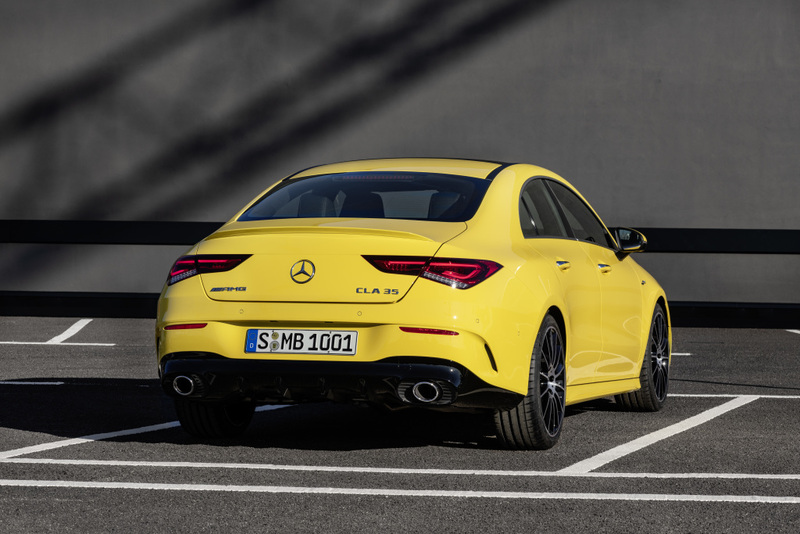 AMG TRACK PACE is also available as an option for the new CLA 35 4MATIC. The virtual race engineer is part of the MBUX infotainment system and permanently records more than 80 vehicle-specific data (e.g. speed, acceleration) while driving on a racetrack. On top of this, lap and sector times are displayed, as well as the respective difference to a reference time. Because specific display elements are shown in green or red, the driver can see at a glance without reading numbers whether they are currently faster or slower than the best time. After putting in some fast laps, the driver can use the data to analyse and, if necessary, improve their driving skills. Also, acceleration and deceleration values (e.g. 0-100 km/h, ¼ mile, 100-0 km/h) can be measured and saved. Thanks to a newly developed algorithm which determines the vehicle position as precisely as possible, AMG TRACK PACE even detects when the circuit has been left or it has been shortened. This is done using GPS data as well as the sensors available in the vehicle (acceleration, gyroscope, steering angle, wheel speeds). The data are displayed on the multimedia display, in the instrument cluster and on the optional head-up display. Well-known racetracks like, for example, the Nürburgring or Spa Francorchamps, are already stored. Furthermore, it is also possible to record one’s circuits. The map display can be switched from 2D to 3D and updated online.